Support the ministries of this OCMC missionary Family. Click here! Thomas Manuel, the son of Fr. 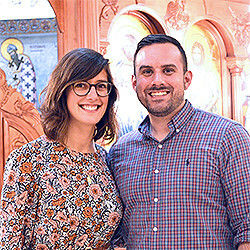 John and Presvytera Karen Manuel, grew up at the center of Church life as while his father served first as a Youth Director and later as a Priest. During his first year in college in 2007 he took a OCF REAL BREAK trip to Guatemala City, Guatemala and while there sparked a lifelong desire to serve in the mission field. After graduating from James Madison University with a dual degree in International Politics, Spanish language and a minor in Latin American Politics he went to Holy Cross Greek Orthodox School of Theology in Brookline, Massachusetts. He graduated with his Master of Divinity in 2014, and since then he has been serving as a Pastoral Assistant and Youth Director of the Annunciation Cathedral in Norfolk, Virginia. Elizabeth Manuel, daughter of Stavroula Marshall, is a native of Norfolk, Virginia and grew up going to the Annunciation Greek Orthodox Cathedral. She graduated from Virginia Tech in 2013 with a degree in Psychology, and is currently working as a Special Education Teacher at a local high school. Shortly after graduating college she felt called to the mission field and this was affirmed during a short-term trip to Guatemala in 2015. She is very active in her Church community as she serves as her parish OCMC Ambassador, teaches Sunday School, sings in the choir, works at the local Orthodox Christian Summer Camp as a co-director and generally assists in the many youth ministry programs. Thomas and Elizabeth met in the summer of 2014 at Annunciation Cathedral in Norfolk. They were engaged in the spring of 2016 and married in January 2017. Serving as long-term missionaries has been a desire of both of them for many years and they are excited to be able to share this ministry together. Since 2010 several thousand of the Mayan people in Guatemala and southern Mexico have been coming into the church through the Greek Orthodox Metropolis of Mexico. The Orthodox Church is now facing a challenge on how to serve the thousands of native people. There is only a small handful of priests available to provide for the people as well as a team of OCMC missionaries to aid in training future priests and skilled lay leaders. Thomas and Elizabeth are thrilled to have the opportunity to join the team down in Guatemala. They recently departed in January for the mission field. Their first stop in southern Mexico, where they will spend the next few months studying in an intensive Spanish language program. Once they are fluent, they will begin their work ministering to some of the may Mayan communities in Guatemala and southern Mexico that have come to Orthodoxy in recent years. Please consider becoming a part of their mission team by supporting them with your prayers and your monthly donations.